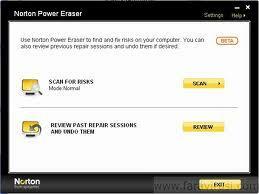 Norton Power Eraser is a software program that will actually eliminate and rid your computer from deeply embedded or hard to remove crimeware. There are a variety of programs that mimic legitimate applications and do all kinds of things including modifying the web browser, boot screen graphics, and redirect traffic. Some scanners just do not find the programs that are damaging your computer. This program has a balance between detection and removing legal files. In some cases, you must have quite a bit of knowledge in order to remove the files that are pretending to be legit. This eraser tool targets this type of program to detect and remove the entire program. The tool will only remove the crimeware and leave truly legit programs in place.